“Occupy Central” is nearly two months old. From the original tens of thousands of protestors, numbers have dwindled to a handful of people, but the road by my Hong Kong office is still blocked. No wonder that, on my last trip to mainland China, young students and netizens were most interested in Occupy Central and were anxious to talk with me about it. I’ve discovered that the mainlanders are deeply worried about “Occupy Central,” perhaps because they basically seem to tend toward two extremes. A minority believes that the Hong Kong government must immediately agree to the students’ demands, while a large majority thinks that the protests have gone on for too long and should be cleared immediately. People in the latter camp think that the students illegally blocking the streets for “Occupy Central” should be arrested and that China must crack down on Hong Kong independence and thoroughly eliminate hostile forces at home and abroad. When you read any mainland news reports on “Occupy Central,” just take a look at the comments at the end to see what I’m saying is true. Of course I know that some comments have been deleted because they “violated relevant rules.” But still, most of the postings that remain are radical criticisms and ferocious curses leveled at Occupy Central, calling for the government to immediately clear out the protestors and arrest people. Judging from the number of postings and their IP addresses, these messages aren’t being left by “50-centers” or the “independent 50-centers.” On some level, these postings truly represent the mainstream opinion in mainland China. The students of Occupy Central certainly violated Hong Kong law; even the three founders of Occupy Central know this. Recently, they promised to turn themselves in to police. The U.S. is also clear on this point, so during the APEC summit President Barack Obama said that America had not supported Occupy Central. President Xi Jinping also made it clear that Occupy Central is illegal. But China’s central government and the Hong Kong government have had the ability to clear the protests from the beginning, let alone now when there are only a few students left holding their positions. 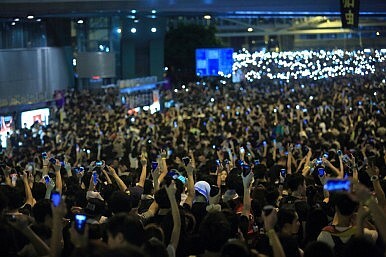 However, the central and Hong Kong governments have permitted Occupy Central to go over for over 50 days. Under these circumstances, why are there still so many netizens and young people filled with intense hatred for the different voices in Hong Kong, to the point that they want to exterminate the dissenters? So I’m not worried about Hong Kong. What I am deeply concerned about is the radical reaction so many of our mainland youths and netizens have toward Occupy Central. In their eyes, it’s as though the students illegally blocking Hong Kong streets and roads are digging up their ancestors’ graves – or as though these protestors had hidden hundreds of millions of taxpayer dollars in their homes. They hate that the central government and Hong Kong government are being too soft, and wish that they could immediately cross the Lo Wu Bridge to lay the hammer down on the Occupy Central students. I could understand some mainlanders being worried about Occupy Central or going to extremes in their opinions in a situation where there’s not enough information or discussion and the facts are being distorted. But in the internet era, there’s no information you can’t access, only facts you don’t want to see or aren’t willing to acknowledge. People who clearly know they don’t have all the information but still take an extreme position are being irresponsible, not only toward others but toward themselves. How a society treats people with different opinions relates not only to the level of political culture in that country, but also to the welfare and even safety of every single individual. I believe many people have heard this poem by Martin Niemoller, who was sent to a concentration camp by the Nazis. But how many people truly understand it? Most people will say, this was written when the Nazis were in power, during the fires of World War II. Today is a different era, a peaceful era. Wrong. Based on my knowledge and experience, I want to tell young people one important thing: in our lives, there will definitely come a time when we are each “reduced” to the status of “dissident,” incompatible with the majority opinion. We might be isolated by the masses and become part of a minority group, suffering misunderstanding and even bullying. How we treat people with different opinions in ordinary times will eventually, at a certain time, come back to us. Maybe someone will say, I stay away from politics! Yes, you may be determined to be very careful for your entire life, going with the flow and keeping your distance from “dissent” – but can you really do it? Maybe you haven’t experienced having your house torn down for the sake of common prosperity, but there’s no way you and your family haven’t encountered some form of injustice. Maybe the housing opportunities and promotions at your job have passed you by. Maybe you were bullied at a government office. Maybe everyone else’s children, but not your own, found good jobs by relying on their “guanxi.” As long as you live on this earth, you will without a doubt have times when you feel lonely or isolated, and you hope to share your story or shout out loud. Some people might not believe this can happen to their families. So your family is wealthy and powerful and has never been isolated – what happens when your family’s patron is labeled a dissident by others? What then? Will an official who embezzled 180,000 RMB in a year receive just and equitable treatment? What about Zhou Yongkang – he labeled so many people as dissidents, but hasn’t he also become a “dissident” thanks to his corruption? Trust me. At some point in your life, you will definitely be a social “dissident” at least once. If you vigorously create a social environment without any tolerance, there will come a day when you or your children will not even have tears left to cry.